At least I think it is a peperomia. 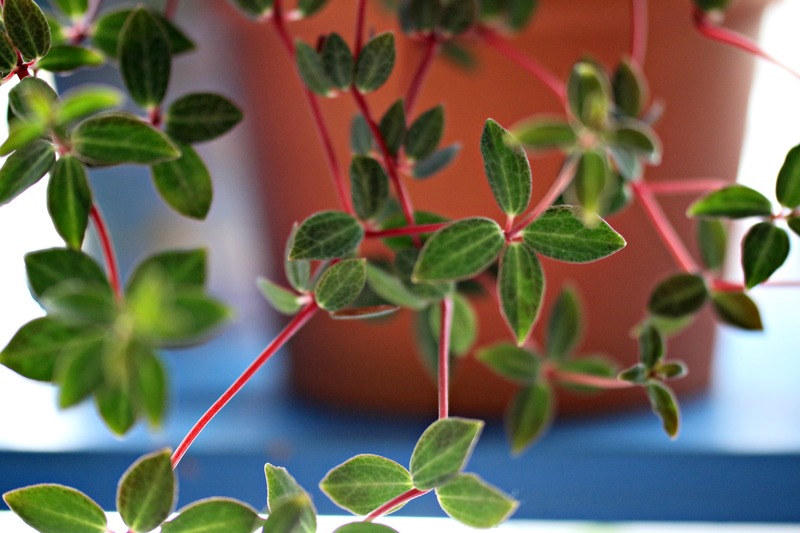 It looks like a cross between Peperomia puteolata (parallel peperomia) and Peperomia prostrata. It has two types of leaves. The lower ones are thick and juicy 🙂 and the upper ones are bigger and flatter. Although I did notice once I take the plump leaves off the stem in about a day they also appear flat, losing all the water they once held. 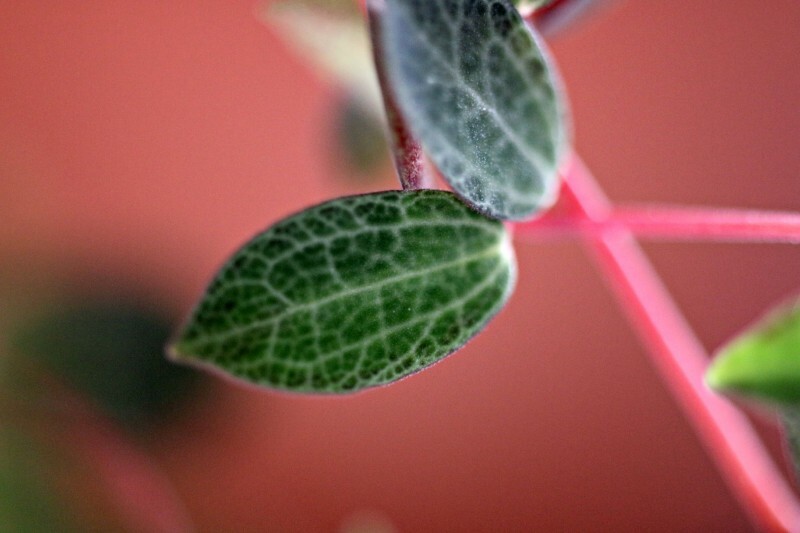 I love the beautiful markings on the leaves. 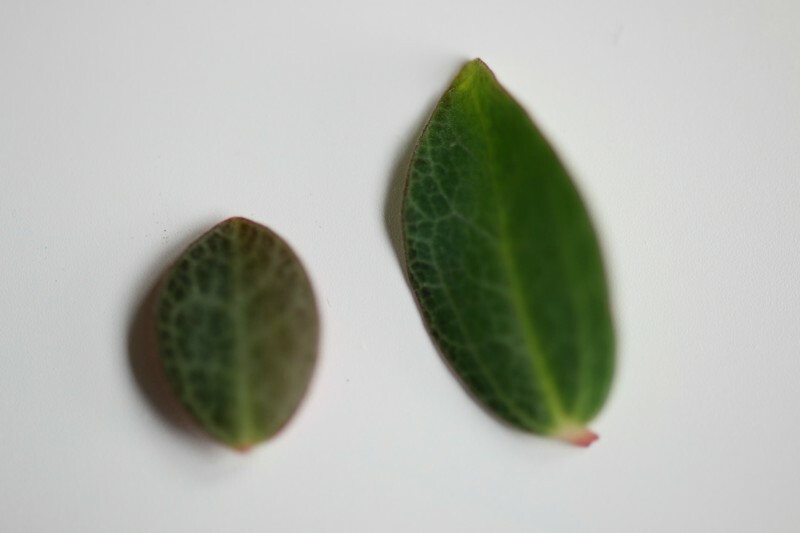 It is a bit similar to that on the leaves of Peperomia prostrata while the red stems are reminiscent of the Parallel peperomia. 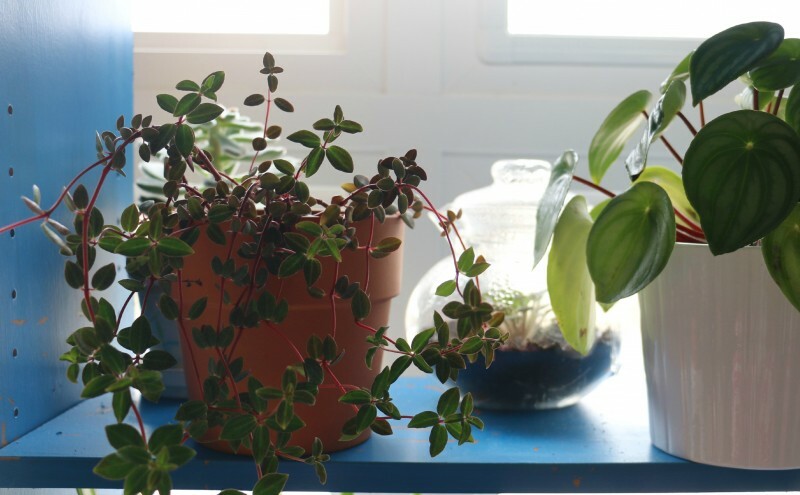 The stems on this plant trails like on the prostrata instead of standing upright like the parallel peperomia. It has a beautiful transluscent surface covering like the prostrata as well which makes it quite hard to get a good focus of the plump leaves on the camera. I keep it in a shouth-west window and it is doing well. I water it like I do my other peperomias. So, do any of you know what the name of this plant is? Any input would be great. 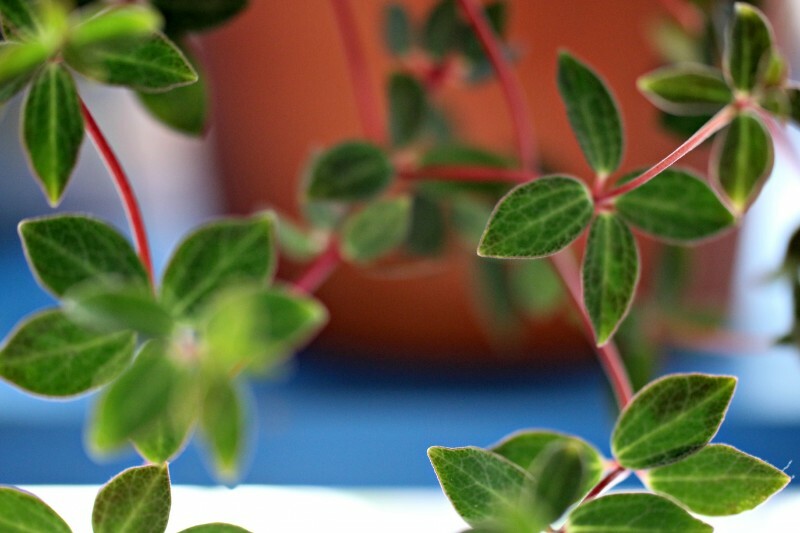 ***EDITED*** this plant has been identified as Peperomia rubella. Thanks Rod Lutes. I’ve had a few Peperomia rubellas and they no matter what type of exposure I give them, or how much water, they are always floppy. Neat plant though! It looks so pretty! I love the purple and the different tones of green. Such a pretty flower! Yea the leaves are very pretty. The pattern on them remind me of lightning. Hi, I’ve never been very crazy about Pepperomia. I have found a few lately I really like and this is one too. Are you the only one that has it right now?? Hi Rebecca, I am not sure. I just saw it at a flower shop a few weeks ago and got it because I thought it was quite strange and hadn’t seen it before. 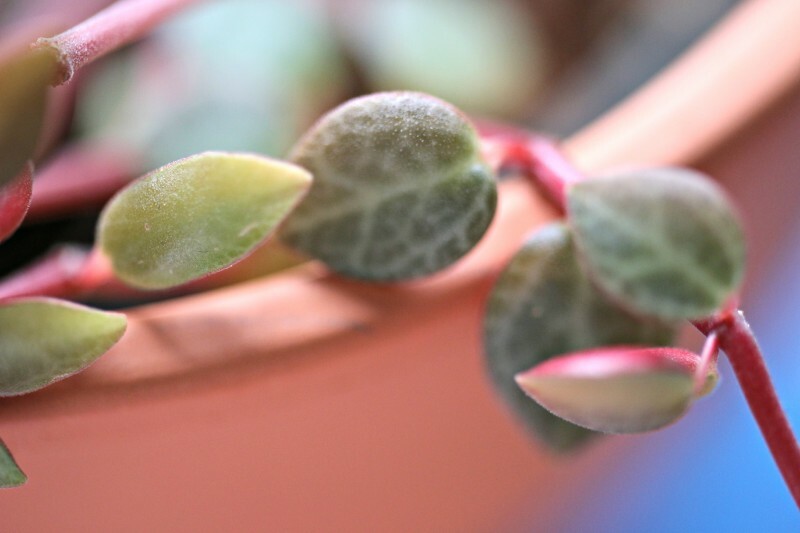 I originally thought it was a parallel peperomia until I took a closer look. The florist only had one in the shop and didn’t know what it was either. Looks like either P. flexicaulis or P. rubella or maybe a cross of those two. Barbara, I think rubella comes from ruber, latin for red, possibly meaning reddish or little red.